Water changes are, by definition, the act of replacing some aquarium water with "new" water. For various reasons, the ways to perform them and their importance are both a matter of some debate and confusion in the world of reef aquaria. Many aquarists perform them extensively, and others never do them. For those who do, the reasons vary and are sometimes even at odds with one another; for example, replenishing "trace elements" and exporting built up "impurities," with the identities of these two being unclear and possibly overlapping. 1. What is in the existing aquarium water. 2. What is in the new aquarium water. 3. What levels are optimal for different species. While several authors have endeavored to more clearly answer these three questions (links to which are given in the references), the questions are really very complicated. Unfortunately, this article will not help to clarify these issues. What this article does provide, however, is a clarified understanding of what water changes are capable of achieving. Using known or calculated rates of addition and depletion of a variety of chemicals in seawater, the effects of water changes can be readily modeled. The impact of water changes on calcium, alkalinity, magnesium, nitrate and sulfate, for example, are shown graphically. In several cases, these examples also serve to provide guidance as to what is occurring with other ions not modeled, but which would increase or decrease in a similar fashion. For example, the control of nitrate accumulation with and without water changes can also show what effect water changes have on other accumulating generic chemicals such as phosphate, organics, heavy metals, and other materials. How much water must be changed depends entirely on what the desired outcome of the water change actually is. If it is to reduce an accidentally added toxin, massive, immediate and repeated water changes may be appropriate. If it is to maintain calcium and alkalinity, large daily water changes may be necessary. If it is to keep slowly added or depleted ions (e.g., magnesium or strontium) from drifting away from "normal" levels, then smaller changes may be adequate. Previous articles on water changes have "shown" that small water changes are not useful, and have sometimes left the impression that even many small water changes are not beneficial. It is also "common knowledge" among many reef aquarists that continuous water changes (where water is added and removed at the same time, usually by automatic pumping) is not very useful "because this removes some of the new water that was just added." As I'll show, these assumptions do not stand up to analysis for typical water change scenarios. Consequently, whether choosing to change a lot of water, or only a little, and whether it is done continually, daily, or only rarely, more water change options are available to aquarists than many realize. These increased options' availability may permit busy aquarists to spend time on other important activities, and less time on water changes, while still accomplishing the same goals. Depending on what is being added, a variety of materials can accumulate in reef aquaria. When supplementing calcium, alkalinity and magnesium, these accumulating substances can include chloride, sulfate, sodium and a host of inorganic and, in some cases, organic impurities in the supplements. From foods, certain metals can build up (copper, for example) as well as nitrogen and phosphorus compounds (nitrate and phosphate, for example). Top-off water can contain a variety of inorganic and organic compounds, and can be a big source of certain ions (silica, copper, etc) if not purified. Even the activities of the aquarium inhabitants themselves can cause the buildup of various materials, such as organic compounds (toxins, metabolic byproducts, etc). Some of these impurities may be well removed by other mechanisms, and some may be well removed only by water changes. The buildup of chloride or sulfate, for example, is not readily countered by any means except water changes (although dialysis type devices can theoretically accomplish the task). Aquarists also often rely on water changes to add ions that are being depleted from the aquarium. Magnesium is a common example; strontium may be another. Many aquarists speak of trace elements being added, but in many cases it is not clear whether new salt water has more, or less, of many trace elements in each of their many different forms (iron, for example). In a certain sense, if an aquarist is comfortable with whatever is in the salt water being used, then it doesn't really matter if it contains any particular material at a higher or lower concentration than the aquarium, because the water change will pull it in the direction of the new water. Of course, the size of the effect will depend entirely on how different the new water is from the old, and what portion of the aquarium water is changed. Without building too much of a case for water changes without a lot of solid information about the three questions listed in the introduction (i.e., what is present in the new and old water, and what is optimal), I will assert that I believe that water changes are beneficial. I do not believe that they are the most useful way to reduce nitrate or phosphate (although they are much better than nothing, as shown below), but they are a good way to reduce organics that are not readily skimmed or bound to activated carbon. Water changes also help export excess metals that build up over time. Copper, for example, tests higher in my aquarium than in the salt mix that I use (Instant Ocean). Finally, water changes aid in keeping the major ions in appropriate ratios, despite the skewing that may come from foods, additives and deposition processes such as calcification (several of which are modeled below). The sections that follow specifically deal with how water changes of various types and sizes can impact these various goals. The simplest water change method to analyze also happens to be a common practice: simple batch water changes performed once a month or so. In this method, an amount of water is removed from the aquarium, and is quickly replaced with new water. There are drawbacks to this method that are discussed in the summary (such as matching the temperature when the change is above 5-10%), but it is the method used by most aquarists. Figure 1 models the depletion of an impurity present in the aquarium water, provided no other inputs of that impurity are added. We can think of it as a percent of the starting impurity, or as ppm nitrate with day zero at 100 ppm, to consider a specific case. The analysis is exactly the same regardless of what the substance is, if we assume that none is added over the course of a year, and that none is generated in the aquarium. Four different water change scenarios are compared: every 30 days a single batch water change is performed of 0%, 7.5%, 15% and 30%. This range was selected to cover the values that most aquarists use, although a few may use slightly larger or more frequent changes. The model is very simple: each 30 days, the nitrate's concentration is diluted by the water change. In the case of a 15% change, for example, the concentration is multiplied by 0.85. Figure 1. Nitrate concentration as a function of time when performing water changes of 0% (no changes), 7.5%, 15% and 30% of the total volume each month. In this example, nitrate is present at 100 ppm at the start, and is not added or depleted during the course of the year except via the water changes. The y-axis can alternatively be thought of as the percent of the original concentration remaining for any material that is not being added or depleted from the water except via the water change. It is clear from Figure 1 that the larger the water change, the more rapidly the nitrate declines. This model is limited in its usefulness, however, in that many impurities are building up at the same time that they are being reduced by water changes. Figure 2 shows the same sort of model where nitrate starts at 0 ppm, and then is allowed to accumulate by 0.1 ppm per day (approximating values potentially encountered in typical reef aquaria, where over the course of a few months, nitrate might accumulate to 5-10 ppm). This model describes reasonably well what might take place in a reef aquarium where the starting concentration of nitrate is zero ppm. Figure 2. Nitrate concentration as a function of time when performing water changes of 0% (no changes), 7.5%, 15% and 30% of the total volume each month. In this example, nitrate is present at 0 ppm at the start, and is accumulated at a rate of 0.1 ppm per day when no water is changed. Figure 3 shows a hybrid model where the nitrate level is initially high (100 ppm) and is allowed to accumulate at the same rate as in Figure 2 (0.1 ppm per day). In this case, it is very clear that water changes can usefully limit the nitrate concentration. Presumably, this sort of situation is the driving force behind water changes in many fish-only aquaria where nitrate buildup is a major concern, where the other nitrogen export methods are not as often used as in reef aquaria, and where especially low nitrate levels may not be as critical as they are in a reef aquarium. Clearly, larger water changes are much more effective than smaller changes for a fixed number of such changes. The 30% change per month gives a nitrate concentration of only 9 ppm after a year, while the 7.5% monthly change yields a concentration of 64 ppm nitrate after the course of a year. Figure 3. Nitrate concentration as a function of time when performing water changes of 0% (no changes), 7.5%, 15% and 30% of the total volume each month. In this example, nitrate is present at 100 ppm at the start, and is accumulated at a rate of 0.1 ppm per day when no water is changed. It is this sort of analysis, unfortunately, that has driven some aquarists to conclude that smaller water changes are not very useful. Yes, a fixed number of small water changes is not as useful as the same fixed number of larger water changes. But there is no reason that the number of changes should be fixed. The following sections detail how smaller changes with the same total volume of new water are nearly as effective as larger ones. As shown in the previous section, a fixed number of small water changes is not as beneficial as the same fixed number of larger water changes. However, for an aquarist who wants to do water changes, the decision of how to change the water should not be driven by that analysis alone. The conclusion of such an analysis is different if one assumes that the aquarist has a fixed volume of water to change, and is just deciding how to accomplish it. For example, with a 100-gallon tank and a goal of changing 30 gallons each month, one might consider changing 30 gallons once, 15 gallons twice, 10 gallons three times, 5 gallons six times or 1 gallon 30 times. In the extreme case, we can imagine changing an infinitesimally small amount of water an infinitely large number of times, eventually consuming the entire 30 gallons (I actually do this in my aquarium, as I'll explain). Aquarists often think that many small changes are not as efficient as one big change since some of the water in all subsequent changes was already replaced by earlier changes. This is a correct assertion, but it is often overstressed. After changing 10% three times, only 10% of the first 10% change was changed the second time (1% of the total). So the difference is small. We can mathematically calculate the efficiency of such changes as follows. If we use our 30% example, then one 30% change removes 30% of the impurities, assuming an equal distribution of the impurity within the water. If we do six 5% changes, then the reduction in impurities = 1-(0.95)6 = 26.5%. So it is less efficient (six 5% changes exactly equal 26.5% changed in one batch), but it is not radically less efficient. Going smaller still, the difference is even smaller. Doing 30 one percent changes removes 1-(0.99)30 = 26.0% of the impurities. where I is the amount of impurities present, Io is the amount present at time zero, e is the constant 2.71828, C is the amount changed, and T is the tank’s total volume. So for 30 gallons changed this way in a 100-gallon tank, the remaining impurity is 0.74 times Io, or a reduction of 25.92%. The table below compares these results for a 30% water change done via different numbers of smaller changes. Clearly, the single 30% change is a little better than the others (70% vs. 72-74% initial impurities remaining), but the difference is quite small, and the difference between the others in efficiency is trivial. Table 1. Water change efficiency for 30% of the total water volume changed. The same analysis can be carried out for larger water changes. Figure 4 shows a graph of the water change efficiency as a function of the size of the individual changes, when 100% of the aquarium volume is changed. Clearly, the very large changes are much more efficient. In an emergency situation when some toxin must be quickly reduced, performing two 50% changes or one 100% change is far better than doing 20 5% changes. In the normal course of aquarium husbandry, however, when, out of concern for stressed organisms, water changes that large are not normally performed, and where water changes are often in the 0-30% each range, Figure 5 shows that the efficiency does not change greatly over the range involved. Figure 4. The efficiency of water changes of various sizes when changing exactly 100% of the water volume. For example, fifty percent on the x-axis implies two water changes of fifty percent each, ten percent means ten water changes of ten percent each, etc. The y-axis represents the percentage of the original impurities present after all of the water changes are completed. Figure 5. The efficiency of water changes of various sizes when changing exactly 100% of the water volume as in Figure 4. The data is expanded to cover just the range of water change sizes usually employed by reef aquarists (0-30%). The cases examined above for nitrate with "once a month" batch water changes can also be examined using smaller, but more frequent, changes. Figure 6 shows results obtained by doing daily batch water changes that amount to a total of 7.5%, 15% and 30% changed each month (0.25%, 0.5% and 1% daily). This graph can be compared to Figure 1, and Figure 7 shows an overlay of Figures 1 and 6. It is clear from Figure 6 that daily water changes are essentially comparable to larger once a month water changes in their reduction of existing nitrate concentrations over a year, as long as the same total volume of water is changed. It turns out that continuous water changes are so close in efficiency to daily water changes that for the sort of data shown in Figures 6 and 7, the results of continuous changes are indistinguishable from those of daily changes (which is clear in Table 1 also, where continuous changes and daily changes (1 x 30) nearly match each other's efficiency). Figure 6. Nitrate concentration as a function of time when performing daily water changes equivalent to 0% (no changes), 7.5%, 15% and 30% of the total volume each month (in other words, 0%, 0.25%, 0.5% and 1% per day). In this example, nitrate is present at 100 ppm at the start, and is not added or depleted during the course of the year except via the water changes. The y-axis can alternatively be thought of as the percent of the original concentration remaining for any material that is not being added or depleted from the water except via the water change. Figure 7. An overlay of nitrate depletion data from water changes as shown in Figures 1 and 6 to allow comparison of nitrate depletion via daily and monthly water changes. Extending this discussion to nitrite accumulation, Figure 8 shows results when nitrate starts at zero ppm and is allowed to accumulate, when water changes are done on a daily basis. These data are comparable to Figure 2, and Figures 9 and 10 compare the two methods (daily vs. monthly) for 7.5% and 30% changed per month, respectively. Figure 11 is an enlarged version of the bottom of Figure 10. In this scenario, there is little difference between the two methods when changing 7.5% of the volume per month, but a somewhat larger difference when changing 30% per month, with nitrate averaging 1-2 ppm lower in the batch case compared to the daily case. Both are far better than no changes, being about 30 ppm lower than without water changes (after a year). Again, the continuous case exactly overlays the daily change case (not shown). Figure 8. Nitrate concentration as a function of time when performing daily water changes equivalent to 0% (no changes), 7.5%, 15% and 30% of the total volume each month (in other words, 0%, 0.25%, 0.5% and 1% per day). In this example, nitrate is present at 0 ppm at the start, and is accumulated at a rate of 0.1 ppm per day when no water is changed. Figure 9. An overlay of the data for nitrate depletion using monthly and daily changes amounting to 7.5% each month. In this example, nitrate is present at 0 ppm at the start, and is accumulated at a rate of 0.1 ppm per day when no water is changed. The data is an overlay of Figures 2 and 8. Figure 10. An overlay of the data for nitrate depletion using monthly and daily changes amounting to 30% each month. In this example, nitrate is present at 0 ppm at the start, and is accumulated at a rate of 0.1 ppm per day when no water is changed. The data is an overlay of Figures 2 and 8. Figure 11. A blowup of Figure 10 to allow comparison of the differences in nitrate depletion between daily and monthly changes amounting to 30% total changed each month. Finally, we can model the drop in nitrate when it starts high (100 ppm) and accumulates at a rate of 0.1 ppm per day, using both daily and continuous water changes. Figure 12 shows the data for daily changes. Again, continuous water changes exactly overlay these results (not shown). Figure 13 compares daily and monthly water changes of the same total volume. Clearly, the size of the water change is not particularly important, and both daily and monthly water changes of the same total volume have a substantial effect on nitrate. Larger total volumes changed obviously have a bigger effect on residual nitrate after a year. Figure 12. Nitrate concentration as a function of time when performing daily water changes equivalent to 0% (no changes), 7.5%, 15% and 30% of the total volume each month (in other words, 0%, 0.25%, 0.5% and 1% per day). In this example, nitrate is present at 100 ppm at the start, and is accumulated at a rate of 0.1 ppm per day when no water is changed. All of these conclusions extrapolate well to other ions that have similar properties. The graphs of dropping initial nitrate concentration (Figures 1, 6 and 7, for example) describe well the drop of any pollutant in the water that is not otherwise being added or eliminated - something that was spilled into the aquarium, for example. Simply think of the y-axis as a percent of the initial pollutant remaining. The graphs of accumulating nitrate concentration (Figures 2, 8, 9, 10 and 11) describe the effects one might expect for other ions, starting with pure salt water. These might include metals that come from foods or top-off water, phosphate and organic compounds. Clearly, the scale of the y-axis would be different, but the effects achieved by water changes of various sizes would be similar. Finally, the graphs of accumulating nitrate concentration where it started at an elevated level (Figures 3, 12, and 13) describe the effects one might expect for other ions when starting with already polluted aquarium water. These might include metals that come from foods or top-off water, phosphate and organic compounds. Clearly, the scale of the y-axis would be different, but the effects to be obtained by water changes of various sizes would be similar. Figure 13. An overlay of Figures 3 and 12 to allow comparison of the differences between nitrate depletion using daily and monthly water changes of the same amount changed. The above analyses show how effective water changes can be at removing undesirable impurities. Water changes can also be used, however, to add ions that are becoming depleted over time. A classic example is magnesium, which can become depleted as it is incorporated into calcium carbonate that is deposited as coral skeletons, in coralline algae and in abiotic deposits on pumps and heaters. In previous articles I have modeled the depletion of magnesium under a variety of scenarios. The first assumes that only calcium and alkalinity are added to reef aquaria, as when using limewater, and the magnesium is allowed to deplete. In that case, the rate of depletion depends on the rate of calcification and the exact organisms depositing the calcium carbonate, since the amount of magnesium incorporated varies from organism to organism. In that article I identified three depletion rates that likely span the range experienced by many aquarists, and these are about 0.1, 0.2 and 0.4 ppm magnesium per day. So starting at a natural level of 1280 ppm magnesium, it is easy to predict what the magnesium levels will become with, and without, water changes. Figure 14 shows the depletion of magnesium at a high depletion rate with daily water changes amounting to 0%, 7.5%, 15% and 30% per month. For most graphs in this article I have chosen to show only the results of daily changes amounting to a particular percentage per month, rather than showing all of the possibilities of continuous vs. daily vs. weekly vs. monthly for each ion. In essence, the conclusions are the same for each method, as long as the amount changed is roughly the same. In a few select cases, I show the data to support this assertion. In order to see the differences in magnesium depletion more clearly, but at risk of exaggerating the effects due to the scale change, Figure 15 shows the same data blown up. Clearly, the water changes can effectively reduce the drop in magnesium, but only the 30% per month method keeps the level from dropping too far. Figure 16 shows a comparison of daily vs. monthly for the 30% case, and indicates that the monthly change is better, but not drastically so. Figure 14. Magnesium concentration as a function of time when performing daily water changes equivalent to 0% (no changes), 7.5%, 15% and 30% of the total volume each month (in other words, 0%, 0.25%, 0.5% and 1% per day). In this example, magnesium is present at 1280 ppm at the start, and is depleted at a rate of 0.4 ppm per day when no water is changed. Figure 15.A blowup of Figure 14 to allow comparison of magnesium depletion rates with different daily water change scenarios equivalent to 0% (no changes), 7.5%, 15%, and 30% of the total volume each month (in other words, 0%, 0.25%, 0.5% and 1% per day). Figure 16. An overlay of Figures 14 and 15 to allow comparison of the differences between magnesium depletion using daily and monthly water changes equivalent to 30% per month. Lower depletion rates will, obviously, require a lesser amount of water to be changed to help overcome the magnesium drop. Figures 17 and 18 show the effects of water changes at these lower depletion rates (the scales are the same as in Figure 15). At the lowest depletion rate, even daily changes amounting to 7.5% per month are adequate to maintain magnesium above 1250 ppm after a year (1250 ppm being the lower limit of the range of 1250-1350 ppm magnesium that I recommend for reef aquaria). Figure 17. Magnesium concentration as a function of time when performing daily water changes equivalent to 0% (no changes), 7.5%, 15% and 30% of the total volume each month (in other words, 0%, 0.25%, 0.5% and 1% per day). In this example, magnesium is present at 1280 ppm at the start, and is depleted at a rate of 0.2 ppm per day when no water is changed. Figure 18. Magnesium concentration as a function of time when performing daily water changes equivalent to 0% (no changes), 7.5%, 15% and 30% of the total volume each month (in other words, 0%, 0.25%, 0.5% and 1% per day). In this example, magnesium is present at 1280 ppm at the start, and is depleted at a rate of 0.1 ppm per day when no water is changed. A final scenario to consider for magnesium depletion comes into play for aquarists supplementing calcium and alkalinity using calcium chloride and either sodium carbonate or sodium bicarbonate (e.g., baking soda, baked or not, respectively). The reason that this scenario is different from the above cases is that the addition of the chloride and the sodium ions tends to raise salinity. If the salinity is then adjusted back to normal levels periodically (by dilution with fresh water), the effect is to depress magnesium faster than in the scenarios above. I have modeled this concern in the context of my "do it yourself" two-part additive system, and have suggested that for moderate use of this system (8 ppm calcium and 0.4 meq/L of alkalinity per day), the magnesium depletion may be on the order of 1.2 ppm per day. That rate is much higher than for the same amount of calcification in the scenarios above (which are designed for limewater which does not have an increased salinity/dilution effect). Figures 19 and 20 show the effects of water changes on magnesium depletion under this supplementation method. From these graphs, it is clear that even with 30% water changes per month, magnesium is not adequately maintained at appropriate levels when using this type of supplement system. That result is why I have included Epsom salts (magnesium sulfate) as a third part in that system, despite the fact that it adds complexity and raises sulfate over time (which is also modeled below). Figure 19. Magnesium concentration as a function of time when performing daily water changes equivalent to 0% (no changes), 7.5%, 15% and 30% of the total volume each month (in other words, 0%, 0.25%, 0.5% and 1% per day). In this example, magnesium is present at 1280 ppm at the start and is depleted by using a moderate amount of calcium chloride and sodium bicarbonate to maintain calcium and alkalinity. Figure 20. A blowup of Figure 19 to allow comparison of different water change rates on magnesium depletion when using a moderate amount of calcium chloride and sodium bicarbonate to maintain calcium and alkalinity. The above model investigates what happens with respect to maintaining something that is slowly depleted, such as magnesium. Some materials, however, such as calcium, alkalinity and silica can be rapidly depleted. In these cases, normal water changes just cannot keep up with the depletion rate, as is shown in this section. Reef aquaria have a range of depletion rates for calcium and alkalinity. At the low end of reef aquarium demand, we might assume a daily depletion of 4 ppm of calcium and 0.2 meq/L (0.56 dKH) of alkalinity per day. That turns out to require the daily addition of about 0.5% of the tank's volume (1/2 gallon to 100 gallon tank) of saturated limewater to meet that demand. Figures 21 and 22 show the drop in calcium and alkalinity, respectively, over a month when doing daily water changes amounting to 0% (no changes), 15% and 30% per month. It assumes that the saltwater being used has a calcium level of 420 ppm and an alkalinity of 4 meq/L. Neither water change rate has an appreciable impact on the calcium and alkalinity drop. In reality, the drop will eventually level-off as calcification is reduced and eventually stops as alkalinity and calcium get low enough, but especially in the first week of the model, it should approximate what happens, and it isn't pretty. Higher demand aquaria (with sometimes five times more demand or even higher in some reef aquaria) will deplete calcium and alkalinity even faster. Clearly, "normal" water changes cannot keep up. Some salt mixes contain excessive calcium. Using a salt mix with 550 ppm calcium will make water changes more effective at maintaining calcium above 380 ppm, but it still does not work out for "normal changes" to be able to maintain calcium levels in the long term. In a low demand model (4 ppm drop in calcium per day), changing 1% daily drops the calcium level to 380 ppm by day 56. Using regular batch "once a month" changes, the calcium level drops from 550 ppm at the start to 438 ppm just before the first water change (472 ppm after it). Then, 23 days later, before the next 30% water change, it has dropped below 380 ppm. Of course, at higher depletion rates the drop is even faster (it takes only nine days to fall below 380 ppm at a depletion rate of 20 ppm per day and changing 1% per day). Figure 21. Calcium concentration as a function of time when performing daily water changes equivalent to 0% (no changes), 15% and 30% of the total volume each month (in other words, 0%, 0.5% and 1% per day). In this example, calcium is present at 420 ppm at the start and is depleted at a low rate of 4 ppm per day. Figure 22. Alkalinity as a function of time when performing daily water changes equivalent to 0% (no changes), 15% and 30% of the total volume each month (in other words, 0%, 0.5% and 1% per day). In this example, alkalinity is present at 4 meq/L (11 dKH) at the start and is depleted at a low rate of 0.2 meq/L per day. In the previous section I showed that normal water changes of up to 30% per month cannot maintain calcium and alkalinity in reef aquaria. But at some point, large enough water changes can do so. 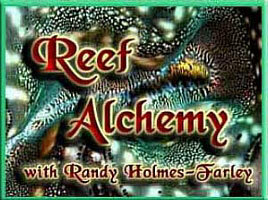 What volume of water change is necessary to maintain calcium and alkalinity in reef aquaria? In a tiny aquarium, 3 gallons for example, large daily water changes might be acceptable. How large is required? Figure 23 shows the drop in alkalinity for a low demand aquarium changing 0%, 5%, 10%, 15% and 30% of the water EVERY DAY. In that case, it appears to require between 10% and 30% of the total water volume to be changed every day to maintain suitable alkalinity. Figure 24 shows similar data for a higher demand aquarium (1 meq/L alkalinity per day). In this case, it takes close to a 50% water change each day to maintain suitable alkalinity. Similar data are obtained for calcium (not shown), where 30% and 50% daily water changes in a high demand aquarium (24 ppm calcium per day) stabilize at 364 and 396 ppm calcium, respectively. So, while changing 50% per day is really out of the question for any normal to large reef aquarium without an inlet directly from the ocean or a large seawater well, a 3-gallon nanoreef aquarium attached to a very slow continuous pump could maintain adequate calcium and alkalinity by replacing 1.5 gallons each day. Figure 23. Alkalinity as a function of time when performing very large daily water changes of 0% (no changes), 5%, 10%, 15% and 30% of the total volume EACH DAY. In this example, alkalinity is present at 4 meq/L (11 dKH) at the start and is depleted at a low rate of 0.2 meq/L per day. Figure 24. Alkalinity as a function of time when performing very large daily water changes of 0% (no changes), 15%, 30% and 50% of the total volume EACH DAY. In this example, alkalinity is present at 4 meq/L (11 dKH) at the start and is depleted at a moderately high rate of 1 meq/L per day. In one of the models described above (Figures 19 and 20) I showed how water changes alone cannot keep up with the demand for magnesium when using calcium chloride and sodium bicarbonate to supplement calcium and alkalinity. In such a system, I have suggested that reef aquarists who cannot find high quality magnesium chloride could manage using inexpensive Epsom salts (magnesium sulfate heptahydrate). The unfortunate drawback of using Epsom salts is the accumulation of sulfate. How well do water changes mitigate this? Figure 25 shows the rate of accumulation of sulfate that I discussed in a previous article in an aquarium with a medium usage of the system (matching a demand of 8 ppm calcium and 0.4 meq/L of alkalinity per day). It also shows the effect of daily water changes amounting to 7.5%, 15% and 30% on a monthly basis. Clearly, the 15% and 30% changes per month mitigate the rise in sulfate over a year by a substantial amount (reducing the increase by 54% and 74%, respectively). Figure 25. Sulfate concentration as a function of time when performing daily water changes equivalent to 0% (no changes), 7.5%, 15% and 30% of the total volume each month (in other words, 0%, 0.25%, 0.5% and 1% per day). In this example, sulfate starts at a natural level of 2710 ppm, and the model assumes usage of a moderate amount of calcium chloride and sodium bicarbonate to maintain calcium and alkalinity, and Epsom salts (magnesium sulfate) to maintain magnesium. There are many ways to perform water changes, and some of these are outlined below. Large batch water changes: These changes are what most aquarists think of as water changes - remove some aquarium water and replace it with new water. Reef aquarists often talk of changing 10-30% per month this way. These changes can be completely manual, using buckets and siphons. They can also be partially or almost completely automated. Some systems allow aquarists to open and close appropriate valves (or turn on appropriate pumps), and pumps take care of the actual removal and addition of water. In doing batch changes, aquarists should consider the changes in the water parameters that will result, and be sure they do not excessively stress organisms. Differences in salinity and temperature are most likely to be significant, and the larger the change, the more stressful it can become for the aquarium's inhabitants. If there is substantial ammonia in the new water, as there may be in artificial salt water or possibly in natural seawater that has been stored for a while, that can also be stressful. Obviously, any organisms that become exposed to the air can also be greatly stressed. Differences in other water parameters are less likely, in my opinion, to be particularly stressful during water changes, with the possible exception of certain trace elements which may be more toxic in raw artificial seawater when not bound to organics than after they have had a chance to become bound in the aquarium or in natural seawater. The normally encountered differences in calcium, magnesium, alkalinity, nitrate, phosphate, silica, pH, etc., are unlikely to unduly stress organisms during water changes up to 30-50% using natural seawater or aerated artificial seawater, in my opinion. Small batch water changes: These changes are similar to the large changes above, but are much smaller and are done more frequently. Daily changes of 0.25% to 2%, for example, can be used. One could also do a series of consecutive small water changes on the same day. This method ensures that organisms near the top of the aquarium are not exposed to the air, and that water parameter shifts are less sudden. These types of changes can be done in a variety of ways, such as by removing water via a skimmer and replacing it once a day, or by simply taking out an amount (such as a half gallon) and replacing it once a day (automatically or manually). While lots of smaller changes (say, 30 changes of 1% each) are slightly less efficient than one larger one (30% in a single batch), the difference is small (30 changes of 1% each exactly matches one 26% batch water change), and consequently other factors of convenience or stress on organisms may be more important. In doing batch water changes of 2% or less, aquarists need not particularly worry about the changes in the water parameters that will result, as long as the new water is of reasonable quality. For example, a 1% change with new water at 55°F from a basement reservoir will change the aquarium temperature only from 81°F to 80.74°F. Differences in salinity are also unlikely to be significant. Continuous water changes: Continuous water changes, despite their name, are not necessarily performed every minute of every day. The distinguishing feature of these changes is that water is added at the same time that it is removed. The actual rate of addition can be high or low. Reef aquarists (myself included) most often perform these types of water changes with two matched pumps, one that removes the old water and one that adds the new water. Often these pumps are part of the same mechanism (such as two sets of tubing on a peristaltic pump or two heads on a diaphragm pump), but that is not a requirement. I use a dual head diaphragm pump capable of a maximum of 30 gallons per day for each head (a Reef Filler pump from Champion Lighting). In my setup, once I have a 44-gallon trash can full of new salt water, all I do to perform a 44 gallon or smaller water change is plug in the pump. The wastewater is sent down the drain. Sometimes I change 44 gallons in one shot, taking about a day and a half. Sometimes I pump for a few hours at a time, and then wait for a few days. These changes are slightly less efficient than single batch water changes of the same total volume. A continuous water change of 30% exactly matches one batch 26% water change. As with very small batch water changes, these have the advantage of neither stressing the organisms (assuming the change is done reasonably slowly), nor altering the water level in the aquarium. The ease of doing such changes automatically also makes it far more likely that busy or lazy aquarists will actually do them. Water changes are a good way to help control certain processes that serve to drive reef aquarium water away from its starting purity. Some things build up in certain situations (organics, certain metals, sodium, chloride, nitrate, phosphate, sulfate, etc. ), and some things become depleted (calcium, magnesium, alkalinity, strontium, silica, etc.). Water changes can serve to help correct these imbalances, and in some cases may be the best way to deal with them. Water changes of 15-30% per month (whether carried out once a month, daily or continuously) have been shown in the graphs above to be useful in moderating the drift of these different seawater components from starting levels. For most reef aquaria, I recommend such changes as good aquarium husbandry. In general, the more the better, if carried out appropriately, and if the new salt water is of appropriate quality. Calcium and alkalinity, being rapidly depleted in most reef aquaria, are not well controlled, or even significantly impacted by such small water changes. In order to maintain them with no other supplements, changes on the order of 30-50% PER DAY would be required. Nevertheless, that option may still be a good choice for very small aquaria, especially if the changes are slow and automatic.